I never thought I’d be writing an article about a screen-cleaning cloth. The vendors of these products regularly send Macworld and other publications samples, and for the most part, one is the same as the next is the same as the next. We of course give each a try, but they almost always end up in a box somewhere—it’s tough to justify writing about cloths, no matter how high-tech their vendors claim them to be. A few months back, I needed to clean my iPad’s screen, and my usual screen-cleaning combination—a few sprays of iKlear and RadTech’s excellent LenSavrz cloth—was packed away, as I’d recently been reorganizing my office. So I pulled out an envelope of samples from Toddy Gear, figuring I could kill two birds with one stone: clean my screen and test a product. A samping of the myriad Toddy Cloth designs available. The Toddy Cloth ($10 for a 5-by–7-inch version; $15 for a 9-by–9-inch version) was a pleasant surprise. I’ve tried many screen-cleaning cloths over the years, and the Toddy Cloth is easily the best I’ve used when it comes to quickly and easily cleaning your screen. A few gentle swipes across the front of your iPad (or iPhone, iMac, or other glossy display), and smudges, fingerprints, skin oil, and dust are gone. It even works better than many of the liquid screen-cleaning solutions that require a lot more rubbing, wiping, and cleanup. 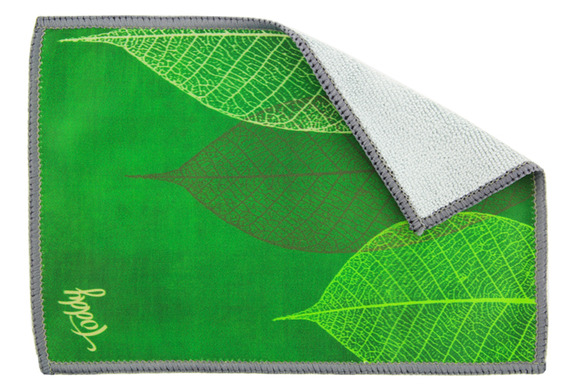 Each Toddy Cloth is made in the U.S. and consists of solid-color plush microfiber on one side for cleaning, and patterned, smooth microfiber on the other for polishing. (I’ve never needed to use the “polishing” side—the plush side always does the job for me.) Toddy Gear says the plush material wipes away oils and smudges so easily because it’s naturally hydrophilic, and that the entire cloth is treated with antimicrobial coating and machine washable. The cloths are available in dozens of colors and design variations. The Pocket Toddy (left), Screensters (middle), and Wedge (right). Note that images are not to scale relative to one another. The company also sells the $10 Pocket Toddy, which is a smaller Toddy Cloth that tucks into itself for carrying on a keychain or attaching to a bag. If you want something with even more um, character, check out the $10 Screensters, ten different stuffed-doll characters, each sporting a smooth-fabric front with the character’s image, a plush back for screen cleaning, and an elastic loop for hanging the doll from your lamp, purse, or bag. (Yes, it works just as well as the cloths.) Finally, there’s the $15 Wedge, which is essentially an iPhone-sized bean-bag stand that’s plush on the bottom, smooth and colorful on the top. All these variations use the same screen-cleaning-friendly materials as the standard Cloths. Toddy Gear’s products are meant for glossy screens, so if you’ve got an older MacBook or other Apple display with a matte finish, you’ll want to look for something closer to the liquid/cloth combination I mentioned above. But when it comes to glossy screens, when someone asks me the best thing for a quick clean—and I get that question surprisingly often—I now have an answer.